It was our last day at Disney. Today we would not be going into the actual parks, and needed to head home early in the afternoon so this will just include breakfast and lunch. All food eaten today would be at the resort hotels or Downtown Disney. 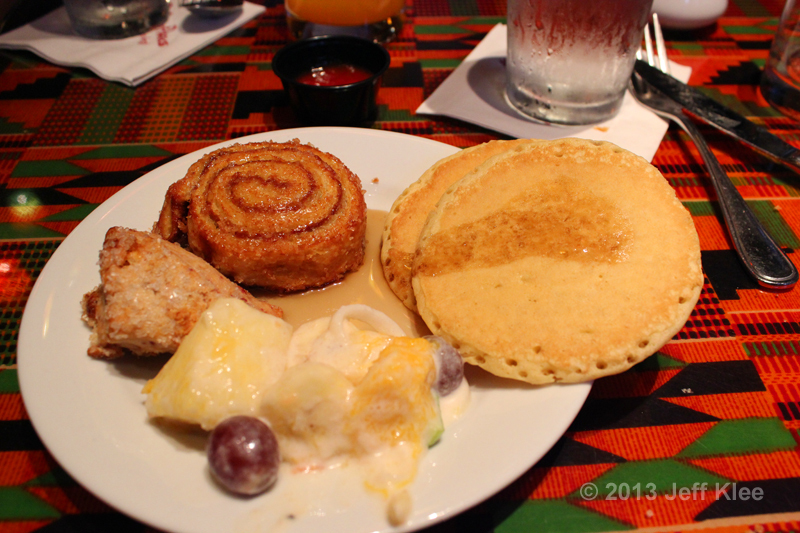 On our last visit to Disney we ate at Boma, which is promoted as Flavors of Africa. It was an amazing buffet dinner with a lot of unique foods, including some “African” twists on more familiar foods. 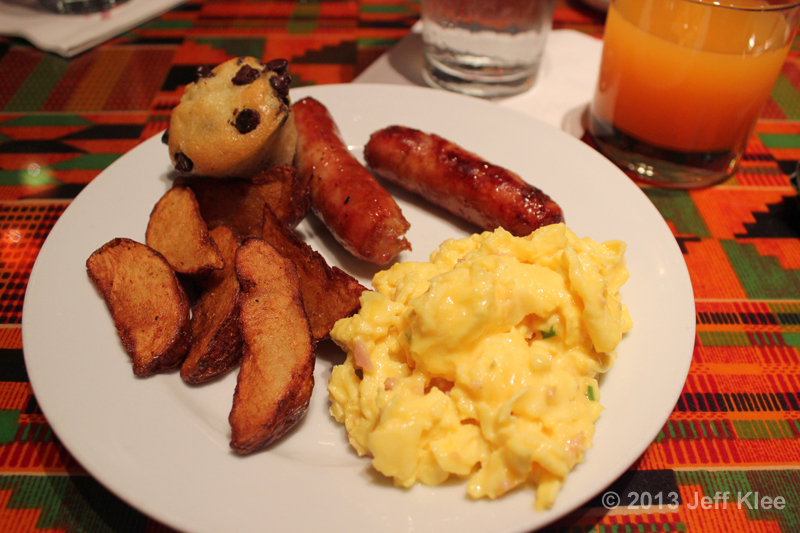 I was excited to try Boma for breakfast, especially after reading of their more than 45 items included in the buffet. 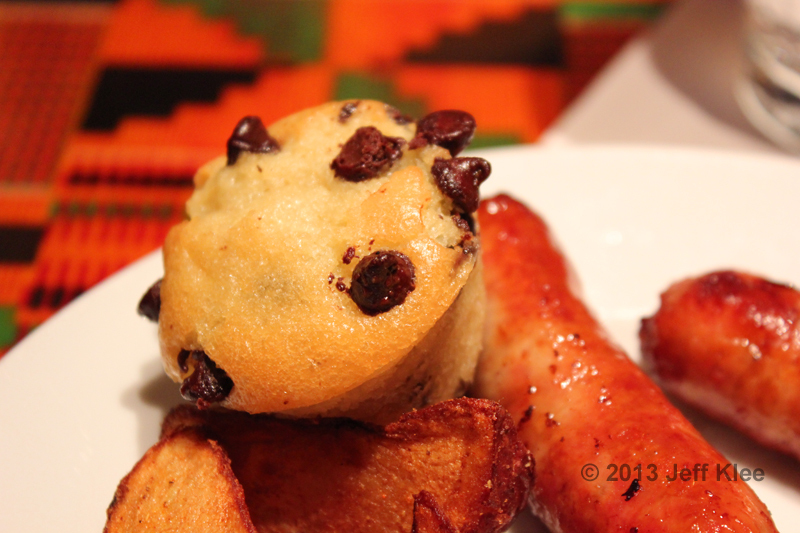 I was curious to see how the “flavor of Africa” would be infused with breakfast foods. Boma is located in the Jambo House, which is at the Animal Kingdom Lodge. We got seated and I immediately went to work. Because this was a buffet, the reviews will be a little shorter and to the point. There would be a lot of individual items being consumed. My first plate consisted of breakfast potatoes, sausage, ham and cheese scrambled eggs, and a chocolate chip muffin. An unusual, but tasty treat. 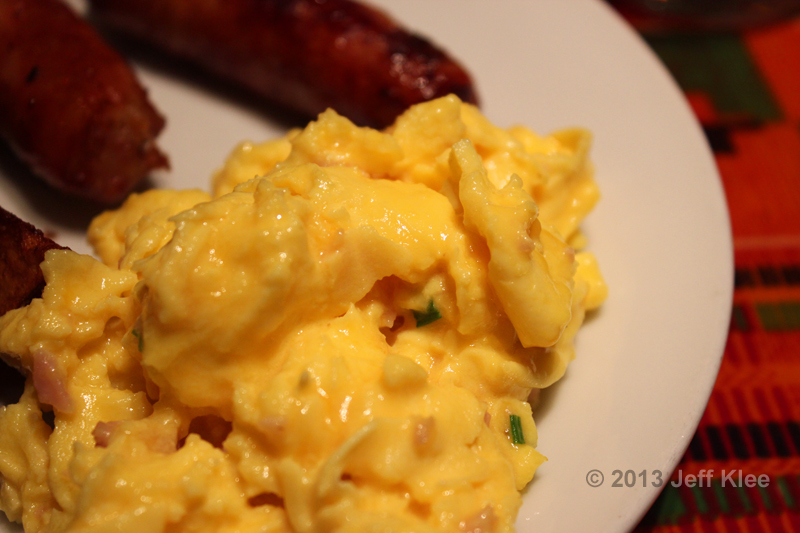 There was a sufficient quantity of cheese mixed in to make the eggs very creamy and cheesy tasting. 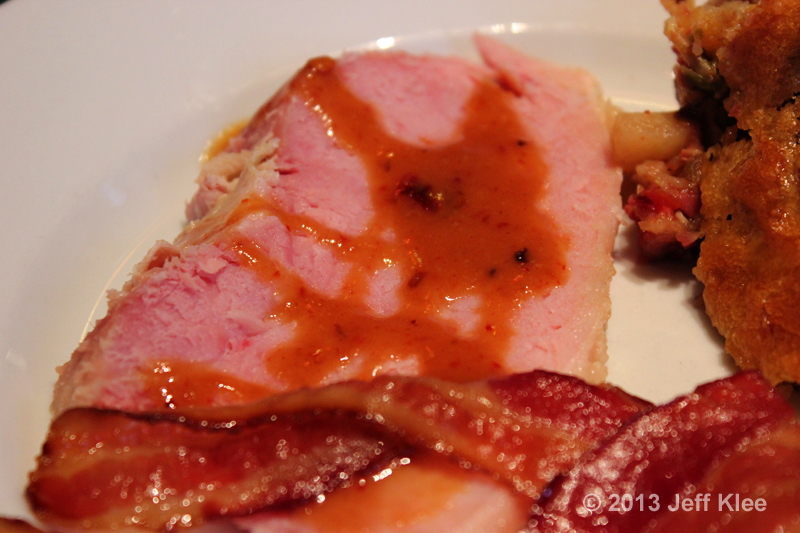 The ham was limited enough so that it didn’t overpower the dish or make it overly salty. I’ve never had this combo pre-made before and I liked how the ingredients blended. Typical potato slices with the addition of a little seasoning including paprika (not spicy at all, and I’m very sensitive to spicy foods). The seasoning made it slightly better than average. 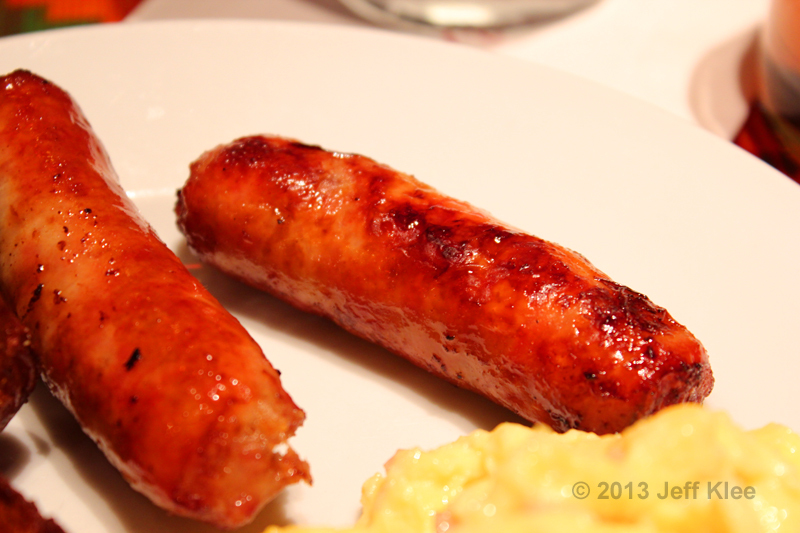 These appeared to be a chicken or turkey sausage, and therefore were much less salty than usual. This made them taste better than average to me. A basic vanilla muffin with chocolate chips that appeared to have been placed after baking, as they hadn’t melted very much. The muffin itself appeared to be a pre-packaged item that was reheated. Plate number two. 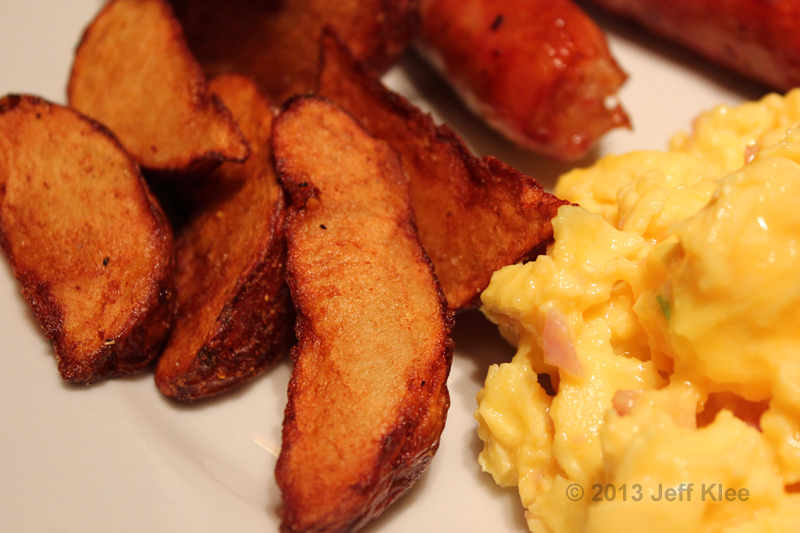 A couple standard breakfast items with one new one. Your standard Disney waffle with the usual fake syrup. Nothing unique. Note: For those that may not realize, when I say fake syrup, I'm talking about the product many (if not most) Americans will buy in the supermarket. These will be brands like Mrs. Butterworth's® or Aunt Jemima®. I have never personally been to a restaurant that uses 100% real maple syrup although I'm sure there are some out there. 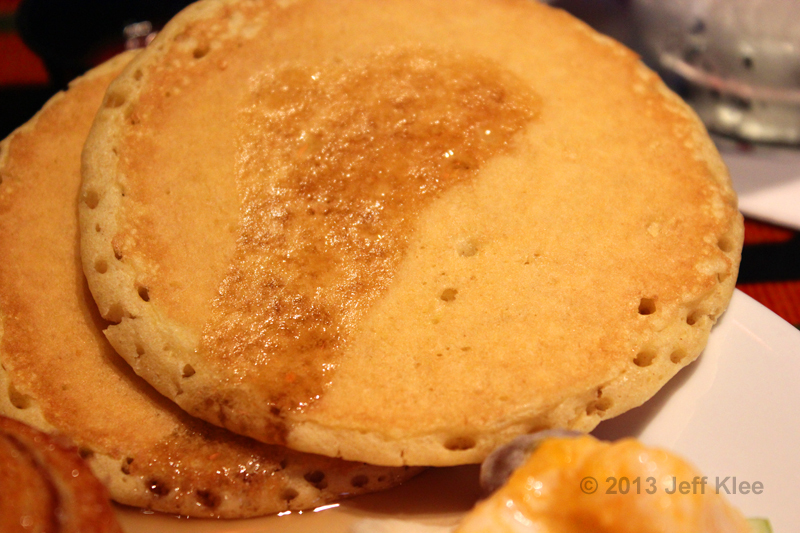 Real syrup is my preferred topping at home. The obvious reason that restaurants don't use the real product is that it costs about three times as much as the manufactured product. Another common item. Pre-packaged croissants that were toasted, nothing special. Something new for me! I love breakfast and I love french toast. 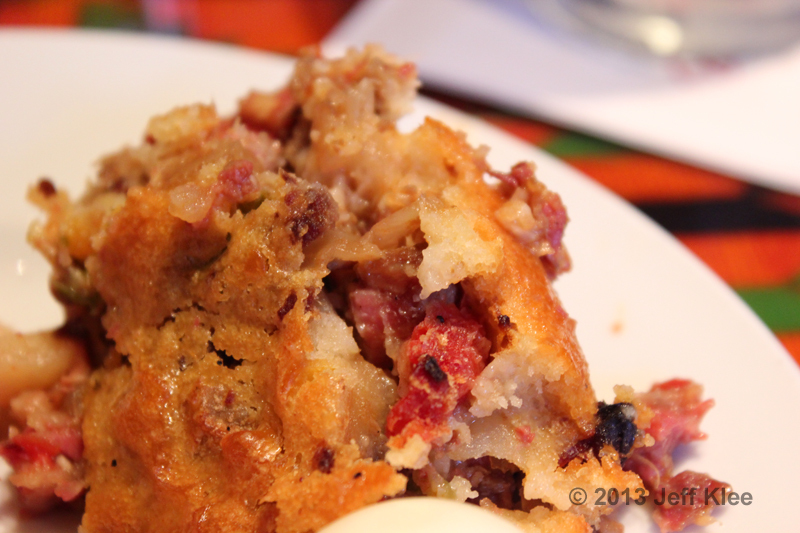 Having a bread pudding made from french toast was something I’ve never seen before. It tasted just like french toast and had a very similar texture. It was not mushy or overly moist. Then there was a pecan praline sauce to pour over it. That’s right, a caramel based sauce to pour over french toast! 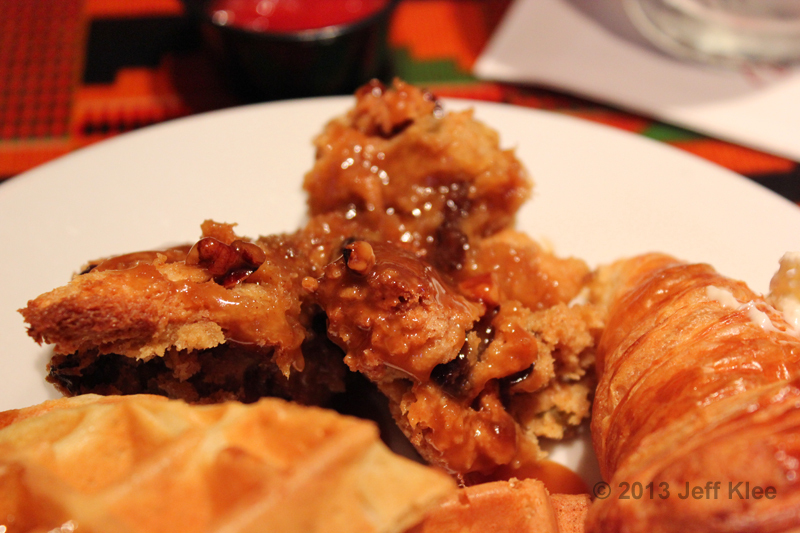 I thought maple syrup was a sugary topping… This was by far my favorite delight from Boma. I thought this was pretty good. The creamy sauce the fruit was mixed in had a pleasing taste and went well with everything. Typical fruits were included; green apple, mango, papaya, grapes, bananas, pineapple, and at the time an unknown item which I later found out to be NOT a typical item in fruit salad. It was sweetened shredded coconut. It wasn’t finely shredded, but more like strips about the width of a fettuccine noodle. You can see one here in the top portion of the fruit salad. It wasn’t until this year that I had my first scone. It was on a cruise ship. 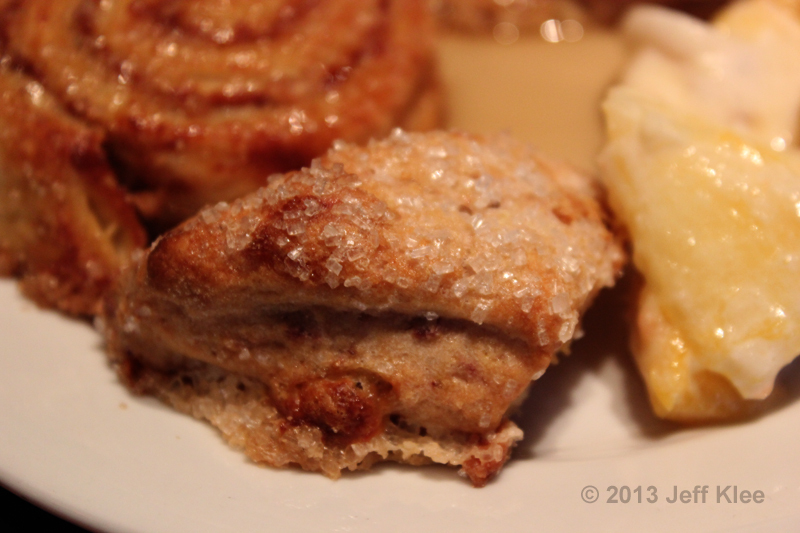 I recently learned through a television show that Americanized scones are much different from proper English scones. I have no knowledge on what a proper scone should should taste like, whether it be an English or American one. All I know is this one was similar to the one I had on my cruise. It tasted fine and of course it was covered in sugar (come on, it’s Disney. You have to make the kids happy! ), so plenty of sweetness in each bite. Both these and the next item were once again pre-packaged items that are reheated on site. Same frozen foods you can buy at home. 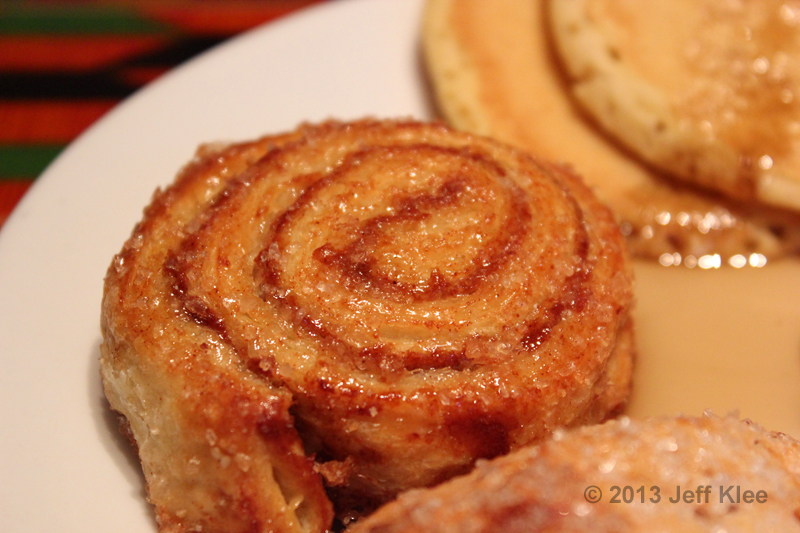 The only difference in the Sticky Bun (known to most of us as a cinnamon bun) was that it had sugar crystals on top. That’s not something seen often. Do I need to say anything here? They are what they are. 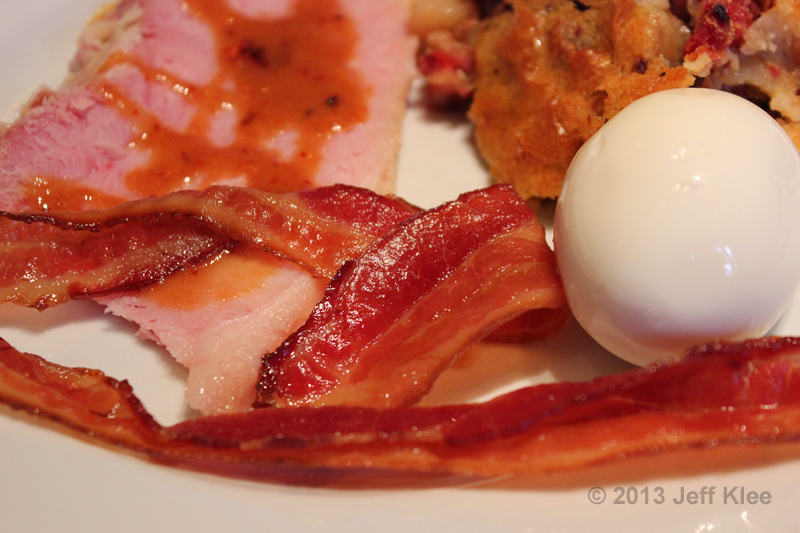 Bacon was soft (resort style as I like to say). 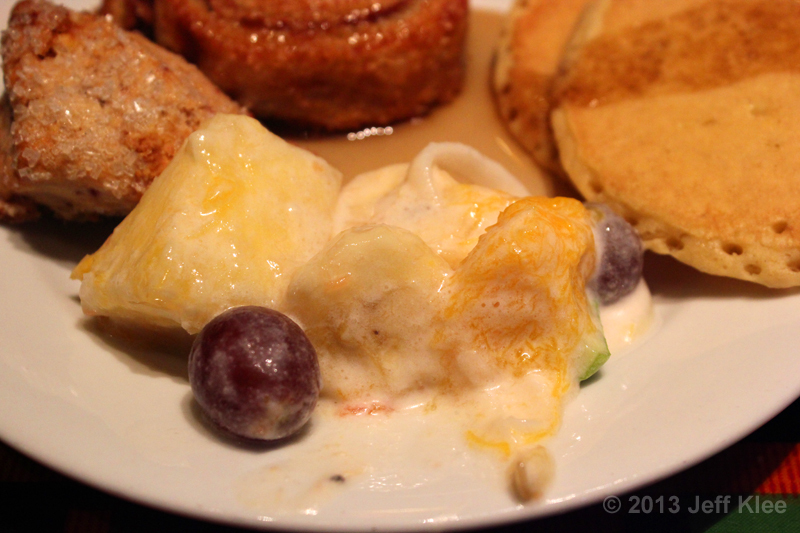 While a little unusual as a breakfast item, this was a great dish. The ham from the fire pit is fresh cut for you upon request and you add your own mustard from the dish at the station. The mustard was indeed sweet and added a great flavor to the saltier ham. I didn’t like this. There were too many things that I didn’t like in here. Bell peppers, onions, and the flavor of the meat just didn’t satisfy my taste buds. I felt like there was too much going on to really enjoy any individual taste. I will say that my wife on the other hand really liked this item. 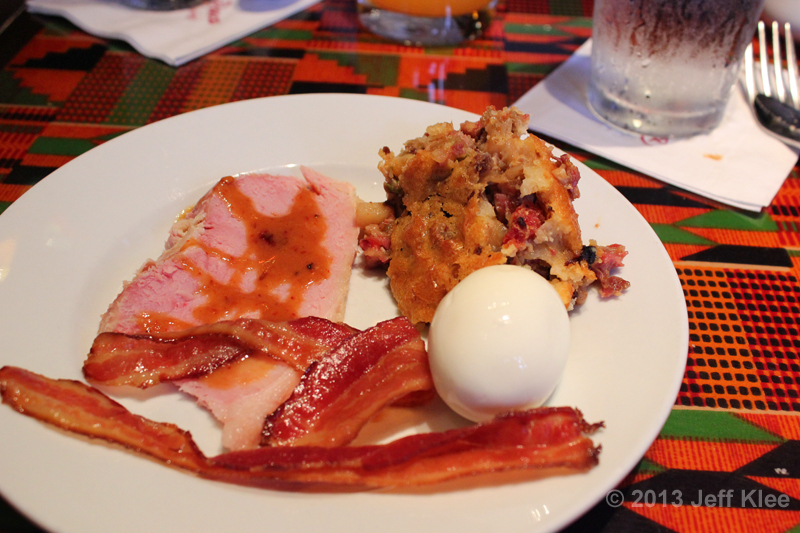 Overall, I was not impressed at all with Boma’s breakfast. Much of the food was very basic, which is to be expected, like bacon, eggs, and waffles. I was surprised by the limited number of unique items, like the French Toast Bread pudding and the African Spiced Corned Beef Hash. I suppose what really surprised me was the unusually high number of foods that appeared to be frozen packaged foods that are reheated. 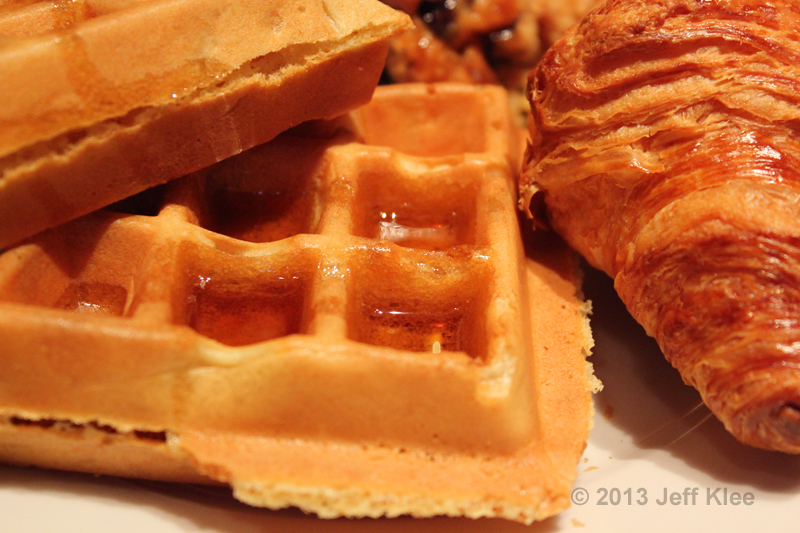 These included the waffles, cinnamon buns, chocolate chip muffins, and croissants. I’m sure it’s necessary in a place like Disney with so many visitors each day, but in some of the “specialty” restaurants like Boma I expected more, especially after that fantastic dinner last visit. I expect this quality more where you have counter service. 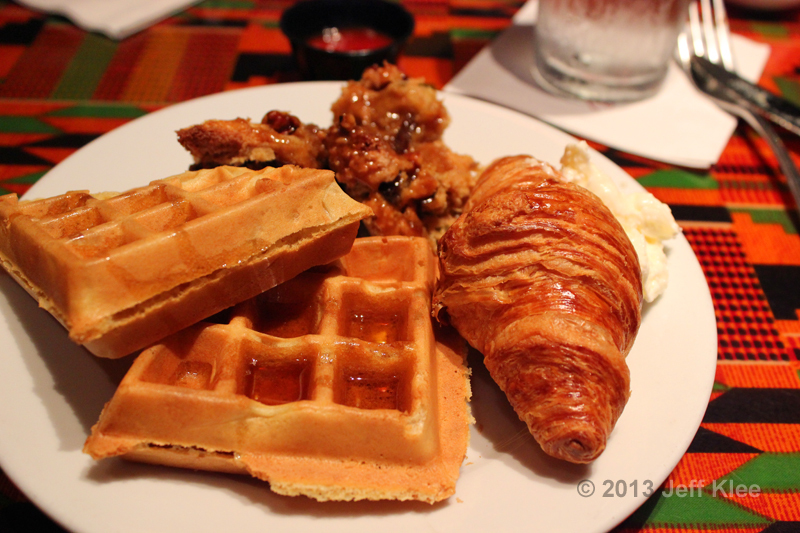 I probably won’t try Boma again for breakfast. 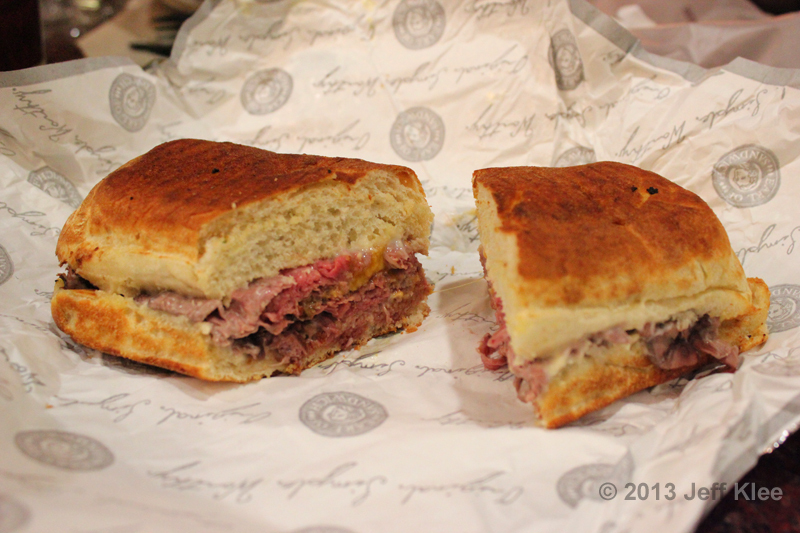 Earl of Sandwich! Rated (as of this writing) #6 of 2,472 restaurants in Orlando on TripAdvisor. 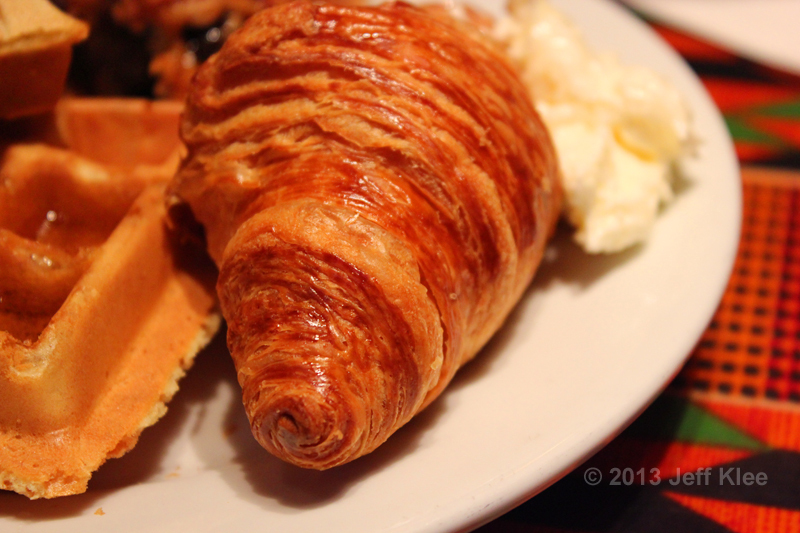 A definite favorite of many who visit Downtown Disney. This has become a traditional stop for us on every visit. For those that don’t know how the ordering works, you order your sandwich at the first station, then walk down the line picking up side items and desserts before paying at the end of the line. Then you find your table and wait for your pager to go off to pick up the fresh made, hot sandwiches. Since I was waiting on my meal, I figured I’d just start with the dessert. The well known (at least a hit item on DFB; whet your appetite here) brownie creme sandwiches were something I had never tried, but now that I was aware of them, I had to get one. 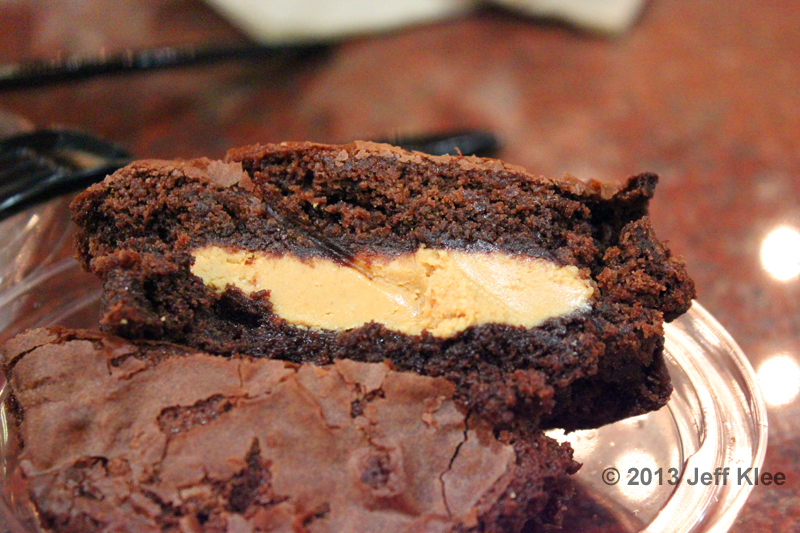 I chose the Peanut Butter Creme Brownie. Photos I’ve seen without size reference do not do this thing justice. It was about three times the size I thought it would be. It really was almost sandwich size. 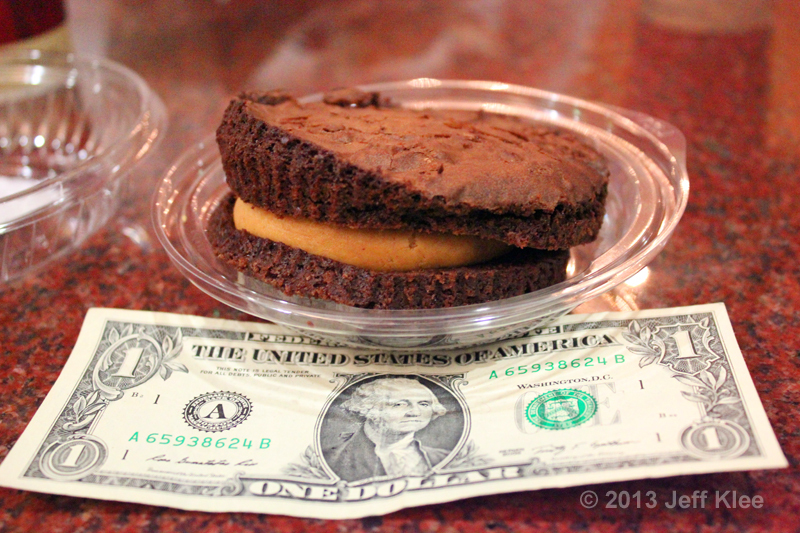 You can see from the photo below that it was about a half dollar bill diameter. The brownie portion was perfect. It was moist, tasted of rich chocolate, and had that perfect crumbly crust on the outside. In between the brownies, was a peanut butter cream that tasted as if it were only one or two ingredients more than pure peanut butter. I could tell from the texture that it wasn’t raw peanut butter, but the taste told me it wasn’t overly processed or fake. I could be wrong but that was my impression after each bite. In all, it was way better than I expected it would be, and more filling too. I was really satisfied with my final dessert of the trip. You can’t go wrong with Earl. 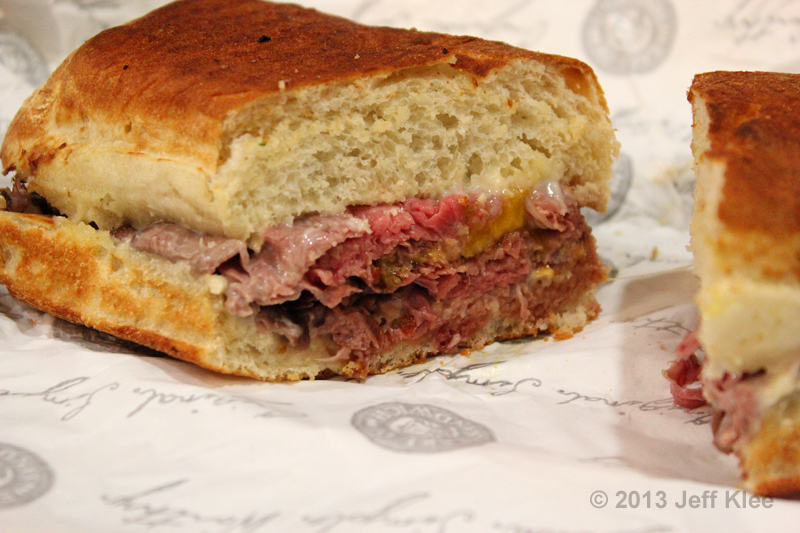 The Original 1762 is roast beef, sharp cheddar, and their own horseradish sauce. I’ve always gotten The Full Montagu in the past and was nervous about trying something new. I’m glad I took the risk. The Original 1762 was fantastic. Roast beef is my favorite deli meat so I knew I was off to a good start. The cheddar was in plentiful supply and I could taste it in every bite. The horseradish was not strong at all, but still had an excellent taste. I may order this again on my next visit. We were on our way home from Disney. I was sad to have not tried many items on my list due to time constraints. I will just have to plan another trip soon to try the rest. 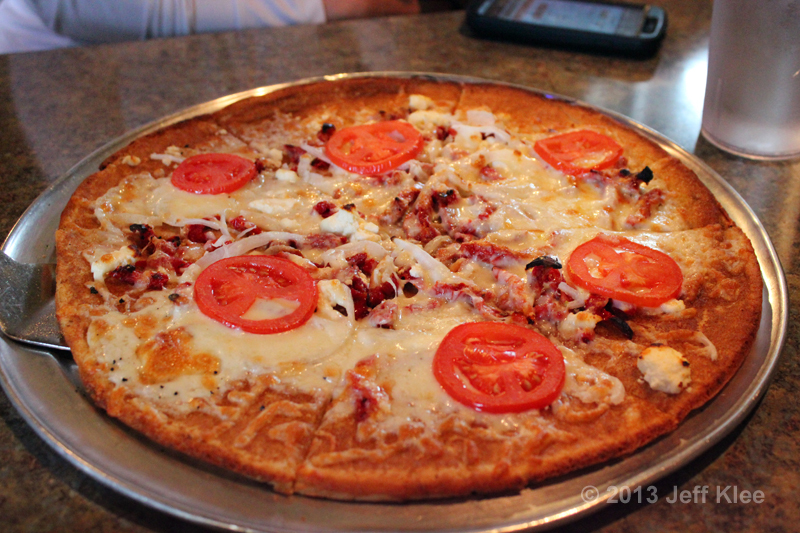 As we neared home we stopped at Mellow Mushroom Pizza in Macon, GA. I know this isn’t Disney food, but it was still considered our Disney “trip” until we arrived home so I’m including it for my own sake. About a month earlier we had eaten at Mellow Mushroom in Stockbridge, GA. The first visit was a much better experience, both for food quality and pricing than this one in Macon, but without comparing the two, this restaurant would get a fairly decent review from me on it’s own. My wife ordered a gluten-free House Special. It’s a 12″ crust with red sauce topped with mozzarella, pepperoni, sausage, ground beef, onions, green peppers, mushrooms, black olives, tomatoes, ham, bacon, and extra cheese. I didn’t try any of it except for a small piece of the crust because she was impressed by the quality of this gluten-free crust. It tasted very close to real pizza crust. I know she liked it because it was the second time she’d ordered the same thing. My order was a 16″ build your own cheese pizza. The base was red sauce with mozzarella. I added ground beef and an extra layer of mozzarella. This pizza was on par for what I consider a good pizza. It doesn’t stand out as being special, but holds its own again other companies’. 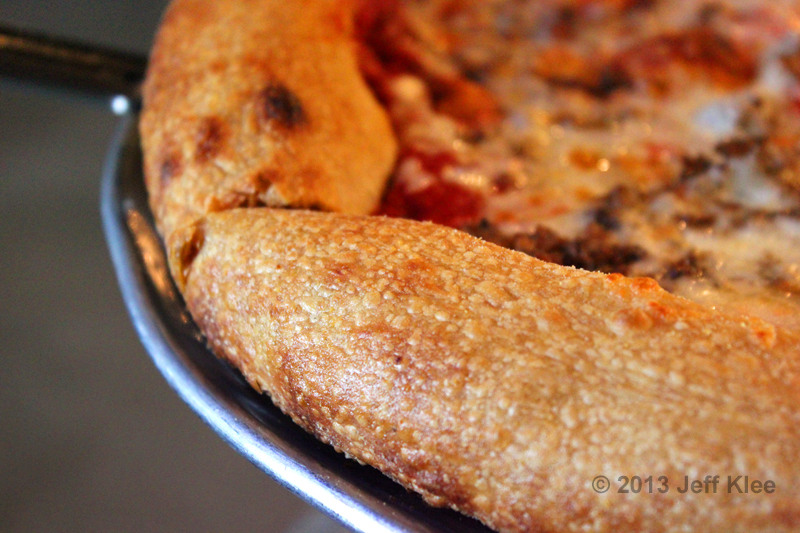 The crust at this location was much different than the Stockbridge location which was one of my issues here, but as this is not a comparison, I won’t discuss it in this review. This crust was very thick. The outside was just the perfect crispiness, and the inside was semi-filled (meaning partly hollow and not solid bread) and soft. 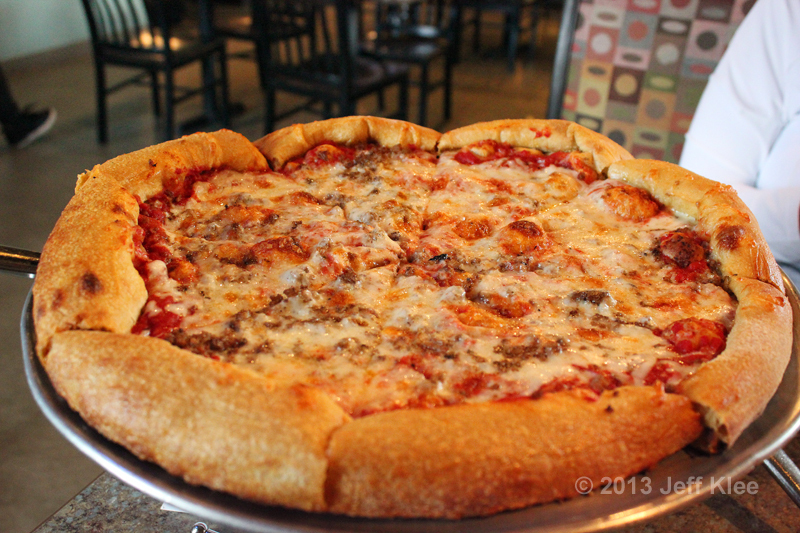 Overall, after a second visit I have to say I like Mellow Mushroom pizzas. I especially like that they are one of the still few pizza places that offer gluten-free options for my wife. The downside is the cost. I didn’t show it here, but my wife ordered a salad as well (I don’t know why, she just ends up not being able to finish the pizza and brings most of it home) and the total bill was $59. As you’ll see from upcoming reviews, I have no problem spending more money on a good meal, but $59 for a pizza dinner for two is a little steep when the pizza is really no better than anywhere else. I guess it’s the price you pay for gluten-free options, which really is a positive for any restaurant in these times of increased allergies. So ends my Disney “food crawl.” It was a fantastic trip, and we are seeing if it’s viable to plan another one later this summer. This now completes the first of hopefully many food reviews I’ll be doing on this blog. Thanks for reading.